Forgiveness is the mental, emotional, and spiritual process of letting go of resentment, indignation, or anger against another person for a perceived offense, difference, or mistake. It can also mean ceasing to demand punishment or restitution for transgressions, real or imagined. Although forgiveness may be granted without any expectation of compensation, and without any response on the part of the offender, it is sometimes necessary for the offender to offer some form of acknowledgment, apology, or restitution; this can often open the way for the person who perceives to be wronged to feel empowered to forgive. The world's religions include teachings on the nature of forgiveness, and many of these teachings provide an underlying basis for varying modern day traditions and practices. Additionally, science is beginning to study concepts of forgiveness. Psychology, sociology, and medicine are among those scientific disciplines researching forgiveness and its impact on human wellness. Some modern studies have sought to understand the relationship between forgiveness and justice; however the idea of unconditional forgiveness can be controversial as it does not require the offending party to change his or her behavior. It is becoming increasingly clear, however, that the key to world peace lies in forgiving and in humankind's ability to transcend the barriers of race, nationality, and religion that have been a constant source of divisiveness and conflict throughout history. The willingness to forgive the violent acts that have occurred on both sides is the first step in achieving the reconciliation that is desired by many and which will allow the development of harmonious relationships among all people. Viewing forgiveness as a gift suggests that forgiveness begins with a decision on the part of the person doing the forgiving. In this case the forgiver lets go of the resentment of a wrong or difference—either real or imagined. As the choice of forgiveness is made in the mind of the forgiver, it can apply to the release of any resentment; whether towards another, one's self, a group, a situation, or even towards God. According to this view, forgiveness of another can be granted without need for the other party to ask for forgiveness. The act of forgiveness has merit in and of itself and can stand alone without condition and is therefore separate from the perceived wrongdoer’s behavior. Although forgiveness may be granted without any expectation of compensation, and without any response on the part of the offender, when the offender offers some form of acknowledgment, apology, or restitution this can often open the way for the person who perceives to be wronged to feel empowered to forgive. As a gift to one's self, forgiveness can alleviate a person's hurt or emotional turmoil, help one to gain closure, and assist in the processing of moving forward with one's life. Conversely, forgiveness as a gift to the forgiven provides them with a clear path for overcoming their resultant guilt and shame, which may be a consequence of their action(s) or inaction. Advocates of this view generally maintain that forgiveness does not entail condoning the wrong or difference that occasioned the resentment. Forgiveness of this nature is sometimes referred to as "selective remembering," whereby one focuses only upon love or loving thoughts and the letting go of negative thoughts. While for many forgiveness seems impossible, and the need for justice overwhelming, there are those who have found it in their hearts to forgive even those who caused them the deepest pain. The result of such forgiveness can lead to healing and positive change for all. Most world religions include teachings on the nature of forgiveness, and many of these teachings provide an underlying basis for modern day traditions and practices of forgiveness. Some religious doctrines place greater emphasis on the need for humans to find divine forgiveness for their own shortcomings, others place greater emphasis on the need for humans to practice forgiveness of one another, yet others make little or no distinction between human and divine forgiveness. Unfortunately, while the sacred texts and the lives of the founders of world religions teach forgiveness, the followers have not always practiced forgiveness. This is particularly noticeable in the religious wars that have scarred human history where members of different faiths have used violence against those who do not follow the same religious path. Nevertheless, each of the following religions has much of value to say about forgiveness. 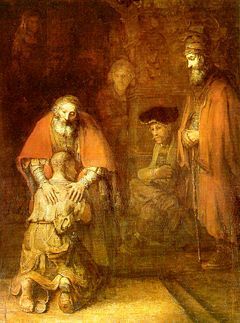 Rembrandt - "The Return of the Prodigal Son"
The Roman Catholic and Orthodox Christian churches teach that God's forgiveness of the believer is mediated by the Church, generally through traditional ritual acts involving an ordained priest. In these churches, and in some Anglican churches, it is customary to make a formal confession of sins individually in the presence of a priest, and to obtain absolution as a formal expression by the church of God's forgiveness. Forgiveness that needs to be earned is only considered if forgiveness is requested or earned through means such as atonement, restitution, or by the offering of sincere apology. Such forgiveness often requires some sort of promise that the offending act or behavior will not be repeated. Forgiveness under these circumstances would be considered conditional upon the actions or words of the perceived wrongdoer. Certain religious views of forgiveness fall under this category, especially when considering receiving forgiveness from God. An example of this would be penance practiced by Catholics and certain other Christian denominations; other religions have similar practices as well. Most Protestant denominations teach that a believer receives forgiveness directly through a sincere expression of repentance to God, and that the believer completes this in the act of forgiving others. Protestant denominations generally place more emphasis on the need for private or informal repentance, and less emphasis on the need for formal or public repentance. However, both Catholics and Orthodox Christians cite scriptural support for a mediated confession by quoting Jesus's direction to his apostles: "whose sins you forgive are forgiven them, and whose sins you retain are retained." Hence, the distinction that only God—or one of His representatives—can forgive sins is cited by Catholics and Protestants alike. It is taught by most denominations that the substitutionary sacrifice of Jesus via the crucifixion is the vehicle through which God forgives the believer of his or her sins. The sacrament of communion is regarded as central to the reception of divine forgiveness. But if the wrongdoer does not apologize, there is no religious obligation to grant forgiveness. This is because Judaism is focused on the personal responsibility of the wrongdoer. It is the wrongdoer's responsibility to recognize their wrongdoing and to seek forgiveness from those who have been harmed. It is not that G-d forgives, while human beings do not. To the contrary, we believe that just as only G-d can forgive sins against G-d, so only human beings can forgive sins against human beings. Jews observe a Day of Atonement on Yom Kippur when they reflect on reconciling with both God and neighbor. Just prior to Yom Kippur, Jews will ask forgiveness of those they have wronged during the prior year (if they have not already done so). On the day itself, Jews fast and pray for God's forgiveness for the transgressions they have made against God in the prior year. Sincere repentance is required since God can only forgive one for the sins one has committed against God; this is why it is necessary for Jews also to seek the forgiveness of those people who they have wronged. Islam teaches that God (Allah in Arabic) is 'the most forgiving', and is the original source of all forgiveness. Depending on the type of wrong committed, forgiveness can come either directly from Allah, or from one's fellow man. In the case of divine forgiveness, the asking for divine forgiveness through repentance is important. In the case of human forgiveness, it is important to both forgive, and to be forgiven. The Qur'an does seem to make allowances, in certain instances, for aggressive behavior on the part of Muslim believers, and such allowances have been construed by some observers as condoning retributive behavior. However, such exceptions are only made within the Qur'an in cases of defending one's faith, one's life, or one's property. This interpretative debate about when to forgive and when to aggressively attack or defend continues to this day within the Muslim community. Although the just requital for an injustice is an equivalent retribution, those who pardon and maintain righteousness are rewarded by GOD. He does not love the unjust. (Qur'an 42:40). Astaghfiru-Allah, "I ask forgiveness from Allah"
Subhanaka-Allah humma wa bi hamdika wa ash-hadu al la Ilaha illa Anta astaghfiruka wa atubu ilayk, "Glory be to You, Allah, and with You Praise (thanks) and I bear witness that there is no deity but You, I ask Your forgiveness and I return to You (in obedience)." The Prophet (may peace be upon him) was the most forgiving person. He was ever ready to forgive his enemies. When he went to Ta’if to preach the message of Allah, its people mistreated him, abused him and hit him with stones. He left the city humiliated and wounded. When he took shelter under a tree, the angel of Allah visited him and told him that Allah sent him to destroy the people of Ta’if because of their sin of maltreating their Prophet. Muhammad (may peace be upon him) prayed to Allah to save the people of Ta'if, because what they did was out of their ignorance. In contemplating the law of karma, we realize that it is not a matter of seeking revenge but of practicing metta and forgiveness, for the victimizer is, truly, the most unfortunate of all. When resentments arise, the Buddhist view is to calmly proceed to release them by going back to their roots. Buddhism centers on release from delusion and suffering through meditation and through receiving insight into the nature of reality. Buddhism questions the reality of the passions that make forgiveness necessary as well as the reality of the objects of those passions. "If we haven’t forgiven, we keep creating an identity around our pain, and that is what is reborn. That is what suffers." The concept of performing atonement for one's wrongdoing (Prayaschitta—Sanskrit: Penance), and asking for forgiveness is an integral part of Hinduism's teaching. Prayashitta is related to the law of Karma. Karma is a sum of all that an individual has done, is currently doing and will do. In Hinduism it is believed that our deeds actively create present and future experiences, thus making one responsible for one's own life, and for the pain one may have caused another. An even more authoritative statement about forgiveness is espoused by Krishna, who is considered to be an incarnation (avatar) of Vishnu by Hindus. Krishna espouses in the Gita that forgiveness is a characteristics of one born to realize a divine state. (Bhagavad Gita, Chapter 16, verse 3). The need to forgive is widely recognized by the public, but they are often at a loss for ways to accomplish it. For example, in a representative sampling of American people on various religious topics in 1988, the Gallup Organization found that 94 percent said it was important to forgive, but 85 percent said they needed some outside help to be able to forgive. Only in the last few decades of the twentieth century has forgiveness received attention from psychologists and educators. Prior to that time forgiveness was a practice left primarily to matters of faith, although philosophers have also studied the concept of forgiveness as something apart from religious adherence. Now a general consensus has emerged that forgiveness is a process. Forgiveness is understood to be the mental, emotional, and spiritual process of letting go of resentment, indignation, or anger against another person for a perceived offense, difference, or mistake. It can also mean ceasing to demand punishment or restitution for transgressions, real or imagined. Forgiveness can be motivated by love, philosophy, empathy, personal temperament, or pragmatism, including fear and obligation. Studies show that people who forgive are happier and healthier than those who hold resentments. The positive benefit of forgiveness appears similar whether it was based upon religious or secular counseling. A number of researchers have developed models of forgiveness, including step by step approaches that allow people to practice and improve their ability to forgive. Robert Enright, a pioneer of forgiveness studies, developed a 20-step Model of Forgiveness. Everett Worthington, a lecturer and author on the subject of forgiveness, has developed the Pyramid Model of Forgiveness. 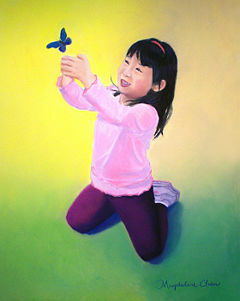 This model involves: recall the hurt; empathize; altruistic gift of forgiveness; commit to forgive; holding onto forgiveness. Guy Pettitt of New Zealand has produced a comprehensive set of materials on both the need for and benefits of forgiveness as well as the process towards accomplishing forgiveness. Some modern studies have sought to understand the relationship between forgiveness and justice. In this context, unconditional forgiveness can be controversial as it does not require the offending party to change his or her behavior. Yoga teachers Joel Kramer and Diana Alstead analyzed the practice of unconditional love and forgiveness as a precursor to authoritarian control and misuse of power. Based on their study of various religions, they suggested that religious imperatives of forgiveness are sometimes used to perpetrate cycles of ongoing abuse: "to forgive without requiring the other to change is not only self-destructive, but ensures a dysfunctional relationship will remain so by continually rewarding mistreatment." When forgiving contains a moral component, there is moral superiority in the act itself that can allow one to feel virtuous. … As long as one is judging the other … how much letting go can there be? … For many people, forgiving is an area of confusion both intellectually and emotionally. 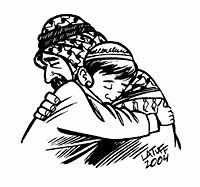 Forgiveness 2 - part of the Forgiveness series by Carlos Latuff. In a landmark study done on Intergroup conflict and forgiveness in Northern Ireland, Ed Cairns from the University of Ulster attempted to identify barriers to forgiveness between Catholics and Protestants who had been locked in a bitter historical struggle. Cairn noted that, "The assumption is that deep down everyone would like to forgive but in fact many people don't want to—especially in Northern Ireland where the wounds run deep." The report continued to reveal that many Northern Irish—Protestants, Catholics, Unionists, and Republicans alike—preferred to hold on to, rather than forgive, the past. However, in light of the recent peace accord reached between Great Britain and Northern Ireland, Cairns commented, "I never thought I'd reach a day where I could think about forgiveness in Northern Ireland. But here I am." Betsie had died in that place—could he erase her slow terrible death simply for the asking? It could not have been many seconds that he stood there, hand held out, but to me it seemed hours as I wrestled with the most difficult thing I had ever had to do. For I had to do it—I knew that. The message that God forgives has a prior condition: that we forgive those who have injured us. "If you do not forgive men their trespasses," Jesus says, "neither will your Father in Heaven forgive your trespasses." Ten Boom goes on to say that it was those prison camp survivors that were able to forgive the Nazi atrocities who were able to successfully rebuild their lives after the war. "Love is the only force capable of transforming an enemy into friend." Martin Luther King, Jr.
↑ 1.0 1.1 Robert Enright, Forgiveness is a Choice (American Psychological Association, 2001, ISBN 1557987572). ↑ National Council of Churches, Journey Toward Forgiveness: a documentary originally for ABC TV. Retrieved May 16, 2011. ↑ 3.0 3.1 American Psychological Association, Forgiveness: A Sampling of Research Results September, 2006. Retrieved May 16, 2011. ↑ Douglas Kelley, Forgiveness: The Key to Long-Term Marriage? Forgiving.Org – Research Projects. Retrieved May 16, 2011. ↑ Bill Griffiths and Cindy Griffiths, The Road to Forgiveness: Hearts Shattered by Tragedy, Transformed by Love (Nashville, TN: Thomas Nelson, 2001, ISBN 0785266917). ↑ Andrew Wilson, (ed.) World Scripture: A Comparative Anthology of Sacred Texts (New York, NY: Paragon House, 1991, ISBN 0892261293). ↑ Edward J. Hanna, "The Virtue of Penance" Catholic Encyclopedia 1911 ed. NewAdvent.org. Retrieved May 16, 2011. ↑ Rabbi Naftali Silberberg, Am I required to forgive a person who has hurt me, if he has not apologized? ask moses.com Retrieved May 16, 2011. ↑ 11.0 11.1 11.2 Tracey R Rich, Yom Kippur Judaism 101. Retrieved May 16, 2011. ↑ Office of the Chief Rabbi, Vayigash 5766 Covenant and Conversation. Retrieved March 14, 2006. ↑ 13.0 13.1 Muzzamil Siddiqi, Forgiveness: Islamic Perspective Islam online. Forgiveness: Islamic Perspective 08/06/2004. Retrieved May 16, 2011. ↑ Qur'an 9:12- "Fight ye the chiefs of the unbelievers." ↑ Anita Anand, Personal Growth - Forgive and Be Free Life Positive Retrieved May 16, 2011. ↑ 16.0 16.1 Ajahn Sumedho, Universal Loving Kindness Forest Sangha Newsletter, October 1997, Number 42. Retrieved May 16, 2011. ↑ Joseph S. O'Leary, "Buddhism and Forgiveness". The Japan Mission Journal 56 (2002). Retrieved May 16, 2011. ↑ Forgiveness versus Might - Anger. Hunduism.com.za. Retrieved May 16, 2011. ↑ R. L. Gorsuch and J. Y. Hao, Forgiveness: An exploratory factor analysis and its relationship to religious variables, Review of Religious Research 34 (4) (June 1993): 351-363. Retrieved August 17, 2007. ↑ Colin Tipping, Radical Forgiveness Theory Radical Forgiveness, Making Room for the Miracle Retrieved July 20, 2007. ↑ Forgiveness: Choosing to Overcome Your Desire for Revenge. Emotional Competency. Retrieved April 16, 2008. ↑ H. Wesley Perkins, Forgiveness, Health, and Well-being in the Lives of Post-Collegiate Young Adults 2002. Retrieved May 16, 2011. ↑ Gregg Easterbrook, Forgiveness is Good for Your Health Beliefnet. Retrieved May 16, 2011. ↑ Everett Worthington, Dimensions of Forgiveness (Templeton Foundation Press, 1998, ISBN 189015122X). ↑ Guy Pettitt, The Heart of Healing Retrieved May 16, 2011. ↑ Jeanne Safer, Forgiving and Not Forgiving: Why Sometimes It's Better Not to Forgive (HarperCollins, 2000, ISBN 0380794713). ↑ 27.0 27.1 Joel Kramer and Diana Alstead, The Guru Papers: Masks of Authoritarian Power (Frog Books, 1993, ISBN 1883319005). ↑ The Price of Peace: Key elements of the peace plan CNN.com. Retrieved July 20, 2007. ↑ Northern Ireland: A Study of Forgiveness and Intergroup Conflict forgiving.org. Retrieved July 20, 2007. ↑ Corrie Ten Boom, Tramp for the Lord (Berkeley Trade reprint, 2002). ↑ How to Forgive "50 Things You Need to Know by 50" in AARP Magazine Retrieved July 17, 2007. Hein, David. "Regrets Only: A Theology of Remorse." in The Anglican 33 (4)(2004): 5-6. Hein, David. "Austin Farrer on Justification and Sanctification." in The Anglican Digest 49(1) (2007): 51–54. This page was last modified on 19 April 2017, at 15:33.